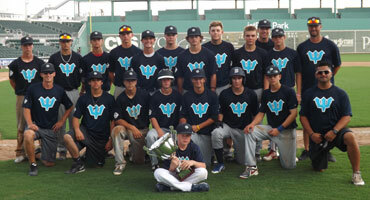 FORT MYERS, Fla. – After a pair of thrilling comeback wins in the 15u Perfect Game World Series semifinals began the morning, two west coast teams met in the championship game hosted in jetBlue Stadium, complete with a replica of the iconic Green Monster casting its shadow in left field under the bright Florida sun. The Team California Warriors sent their ace, left-handed Damien Rinehart, to the bump to face the northwest-based West Coast Mariners in hopes that he’ll continue to shut down hitters like he’d been able to do all tournament. The two traded zeros until the top of the third, when a single by Rinehart, the tournament’s Most Valuable Player, broke the scoreless game and put the Warriors in the run column. A two-out double to deep center field by Sam Wezniak added the team’s second run of the inning, which proved to be more than enough for Rinehart to work with. The Warriors were able to tack on another run in the top of the fourth inning and two more insurance runs in the top of the last frame, all while holding the Mariners scoreless. An uneventful bottom half of the inning once again kept the Mariners from breaking into the runs column and gave the Team California Warriors the 5-0 win and 15u Perfect Game World Series title. The show belonged to Rinehart, though, who recorded his second complete game shutout of the tournament to earn to win on the mound, while collecting his eighth base hit and RBI three and four, putting him at .500 (8-for-16) for the week. Rinehart’s display on the mound was pure dominance, as he surrendered just a pair of singles and three walks, while tallying nine strikeouts. Rinehart was as efficient as they come, throwing 67 of his 109 pitches for strikes and retiring 10 of his 21 outs on three pitches or less. 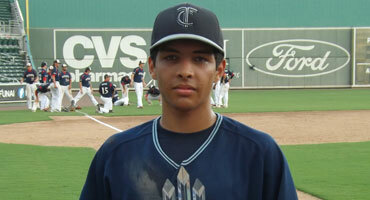 He started five of his seven innings out with a leadoff out and had a pair of 1-2-3 innings. “This is the first time I’ve experienced something like this before, so it’s really nice to actually step foot in a stadium and throw like this,” said Rinehart. Rinehart shut out the Houston Banditos Black earlier in the tournament, giving up just four hits and four walks while collecting five strikeouts. He finished the tournament with 14 shutout innings, six hits given up, seven walks, and 14 strikeouts, giving him an average one strikeout per inning. Rinehart rose to the occasion on the big stage Wednesday afternoon and turned in a performance we won’t soon forget. Teammate Jack Melton completed a formidable 1-2 punch on the mound, earning tournament Most Valuable Pitcher honors after recording a dominant complete game shutout against the reputable Elite Squad Baseball on Tuesday. It was a 113-pitch outing for Melton, who recorded three 1-2-3 innings and retired the leadoff hitter in six of the seven innings. He gave up just three hits and three walks and tallied an impressive nine strikeouts. 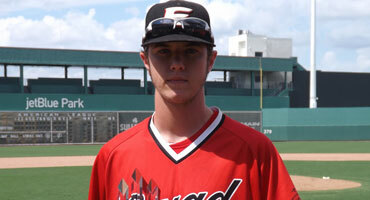 Rinehart feels fortunate to have a talented pitcher like Melton by his side. “It’s nice because you’re able to trust your other pitchers when you know they’re as good as you are,” Rinehart said. The two pitchers are both competitive by nature, but work to make each other better. It was anything but an easy path to the championship for the Team California Warriors. It took a nine-inning thriller Wednesday morning to decide who would advance past the Evoshield/Team California matchup, with the Warriors winning in walk-off fashion and carrying that momentum to the championship game. 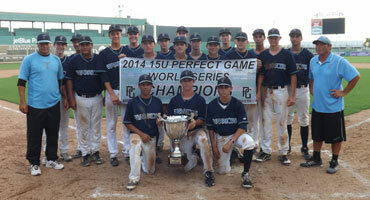 Another thrilling championship game followed with the 16u Perfect Game World Series. The Dallas Patriots, your 2013 15u Perfect Game World Series champions, met the south Florida-based Elite Squad Baseball in a game that was every bit as good as one would think when two powerhouse organizations meet. It was a ‘never say never’ kind of championship game for the Patriots, a fitting ending to continue the trend of the entire tournament for the Texas-based club as they charged back with four outs to play with and beat Elite Squad, 6-2. The same group to hoist the 15u Perfect Game World Series trophy last year got to do it again almost a year later to the date, this time with the 16u title. Elite Squad Baseball broke into the runs column first thanks to n RBI single off the bat of Joseph Perez in the bottom of the second. 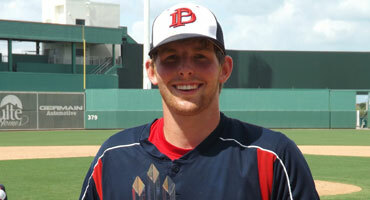 They added an additional run in the bottom of the fifth as Anthony Masiello kept the Dallas Patriots off the board. However, the trend of the Patriots’ tournament had been coming from behind and that’s exactly what they did again. Tournament Most Valuable Player Michael Neustifter got the comeback started with a two-out double to right field. A few batters later, Trevor Paradoski put the Patriots on the board with a bases loaded line drive single to center field to drive in two runs and tie things at 2-2. With just four outs for the Patriots to do something with the momentum took a dramatic swing from the first base dugout to the dugout on the third base side. The rally didn’t stop there, however. Zack Chastain ripped an outside fastball to right field, which ended up in the corner for a two-run triple, giving the Patriots their first lead of the ballgame at 4-2. The Patriots got into an unstoppable groove that continued in the top of the seventh thanks once again to a double by Neustifter who took a fastball deep to left that hit high off the replica Green Monster at jetBlue Park. Hunter Seay showed off the big bat he displayed in June at the National Showcase when he immediately followed Neustifter’s double with one of his own. His to center field to drive in two more runs to cap off the scoring at 6-2. A 1-2-3 bottom of the seventh ended in a dog pile near second base after the final out was recorded on a pop out to the shortstop. It was anything but an easy road to the championship for the Patriots. They faced the challenge of making it out of pool play after a 3-2 start in the tournament and barely got past the Florida Burn and Austin Bergner’s electric arm in Wednesday’s semifinals matchup. The Patriots fell behind early, 4-0, but used that ‘never say die’ mentality to come back and score the game winning run in the top of the seventh ending, only to have to dig themselves out of another hole in the championship game. Stout and his guys are familiar with hoisting the World Series trophy. They did it just last year at the 15u age group and accomplished the rare repeat. Neustifter earned MVP honors after finishing the tournament with a .321 batting average (9-for-28) with four doubles, a triple, eight RBI, and eight runs. 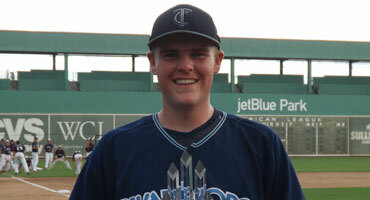 He also put up great numbers on the mound, tossing six shutout innings to earn a win, while collecting five strikeouts. It was déjà vu for Neustifter, who won the Most Valuable Player at last year’s 15u Perfect Game World Series. Elite Squad Baseball southpaw Garret Rukes took home the Most Valuable Pitcher hardware, earning a pair of wins in two five-inning starts. He combined to give up two hits and a walk, while tallying 12 strikeouts. Elite Squad Baseball came up just shy of the 2014 16u Perfect Game World Series title, but Rukes is still proud of how far his team made it in the incredibly competitive field.